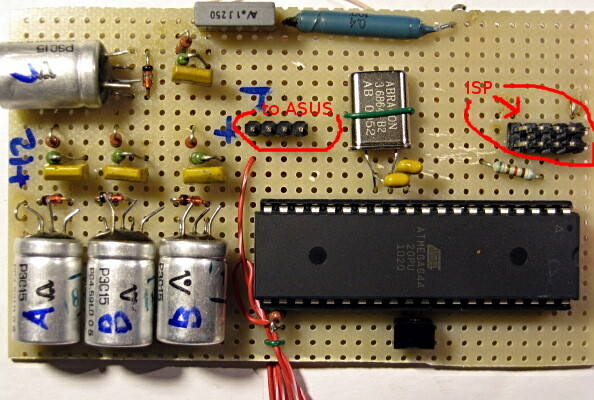 Though I put 'OpenWRT' word into the header, this HowTo is about Oleg's NG firmware, http://code.google.com/p/wl500g/ . This firmware based on original one from http://oleg.wl500g.info/ . But 'OpenWRT' from the first glance helps you catch up another way to use custom software with your favorite router. I had no option to try OpenWRT out since my box model was not supported then. Oleg's NG firmware (I omit first word and will call it "firmware" later on) has few changes in compare with original one, for example, Linux 2.4 kernel was replaced with 2.6 and firmware supports much more ASUS routers. That firmware and OpenWRT have a lot of similarities (as well as differences), but in the most aspects all below is valid for OpenWRT with minimal changes in mind. In summary, this HowTo intended for building reliable internet link with ASUS router box using USB 3G dongle. Simple external Watch Dog (WD) controller does USB reset and router reset as well if it hangs for some reason. 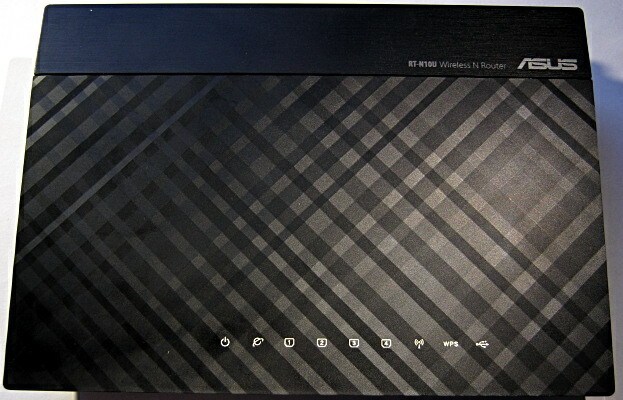 You need some ASUS router supported by firmware (please refer  for compatibility list). Since 3G dongle uses USB, router model without USB port is pretty useless. Instalation process firmware chewed up in details here . Hope you had enough patience to follow up all the instructions, succesfully completed all steps and finally have running box with new pretty firmware. Few things should be done however after upgrade. Out of the box the only ext3 filesystem is supported, but you can download kernel modules for ext4 for instance. More additional packages could be installed just like that. Getting back to mount process of flash or USB hdd. # hope you already made swapfile ? 3G USB dongle setup with PPP is pretty straightforward for any Linux. Instructions could be found here for example. Ok, now you have ASUS box with new firmware and 3G link up and running. Location, connectior type and pinout can differ (you can easily find out info for your model), but it is always 3.3V RS-232C. 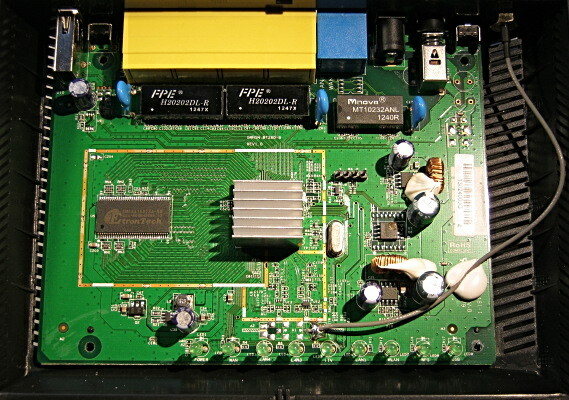 This connector type and pinout valid for RT-N10U router. 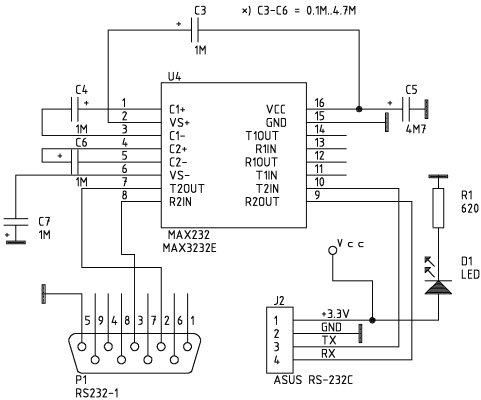 I have used USB/RS-232 PC converter on my desktop. Therefore my tty device name is /dev/ttyUSB0. Last string is very promising since we can try RS-232 out for router acccess. Ok, RS-232 is fairly usable now. Hope 3G PPP link still working. Problem however that most of USB dongles hang occasionally and unfortunally the only way to continue is plug-off/plug-on procedure. I have seen some simple solutions using router LED for USB power switching with (MOS)FET conductors, but strongly oppose this idea. NOTE, if you play with USB +5V power only while left Data+ Data- connected with most probably some signals active it is short way to burn your 3G dongle! If you examine edge of USB connector, notice the side wires (+5V, GND) are longer, thus connected first/disconneced last upon plug-on/plug-off. 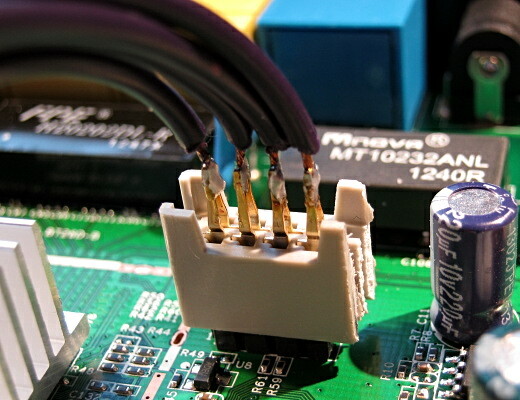 Power +3.3V is coming from router RS-232C connector. 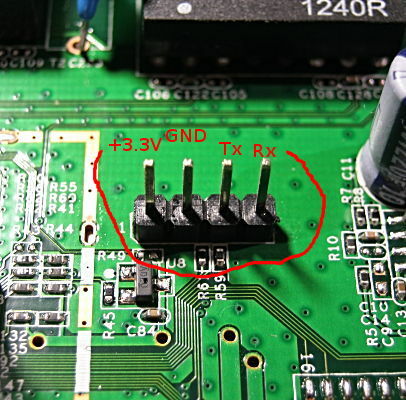 +12V power is taken from the router's input power connector. 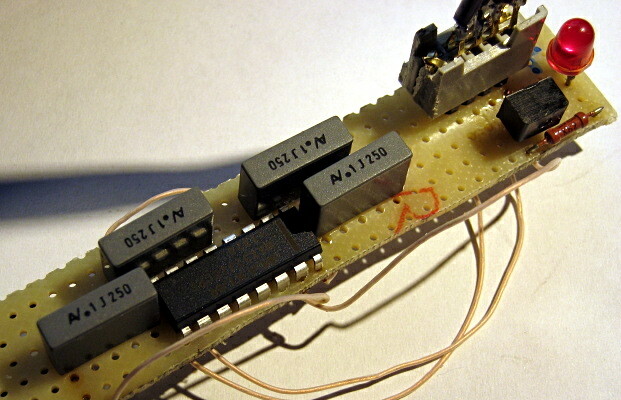 ATMega 324/644 is a drop-in replacement for 164. 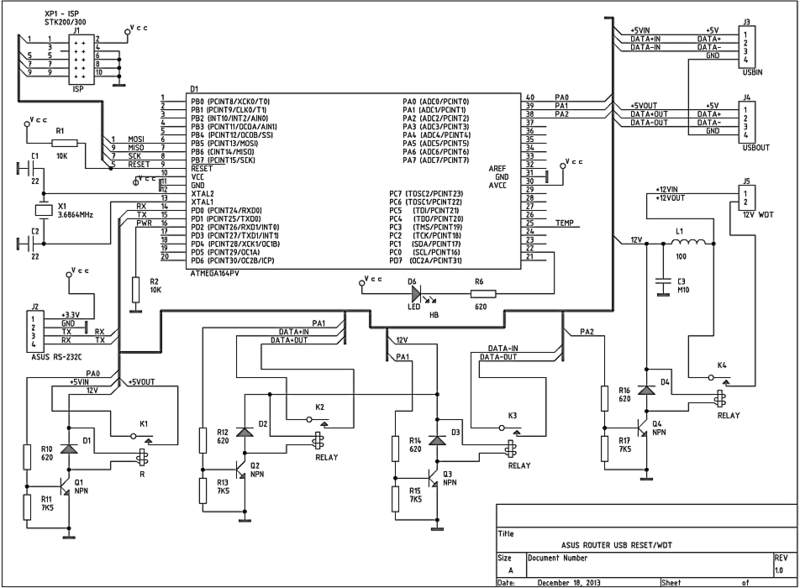 Apparently any ATMega or ATiny could be used (firmware recompilation required). Relays - any designed for 9-12V voltage with pair of closed contacts. 3G dongle is connected after USB hub. 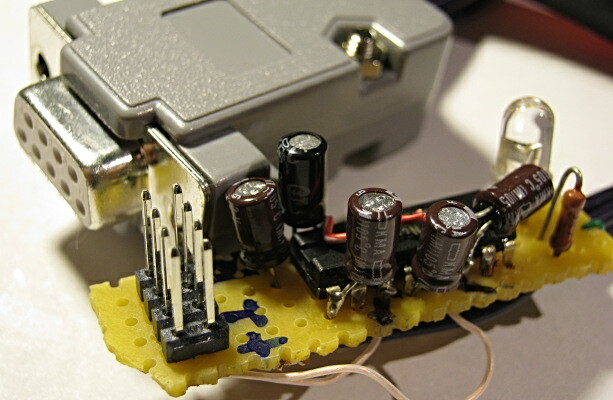 +5V, Data+ and Data- wires are cutted in USB extension cable ang go through relay K1-K3 (J3-J4). K1 relay switches USB +5V, K2 and K3 USB Data+ and Data- correspondingly. Relay K4 is connected in parallel with router power switch and if one is off, controller can handle router power. Q1-Q4 are any n-p-n transistors suitable for +12V and relays nominal current. When controller restarts USB, Data+/Data- wires are disconnected first and connected only after +5V is connected. 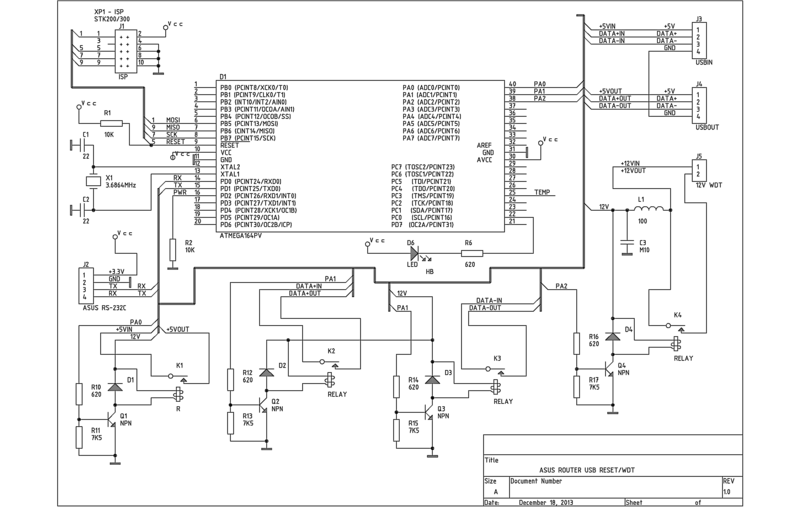 All communication between controller and router is going via RS-232 port 9600 8N1 protocol. LED indicates operation mode, fast blinking means waiting mode and slow one when WD is ready for commnands. The thing is that even RS-232 initial router speed (115200) differs from WD (9600) there is some junk recieved while box is booting. Right after power-on cycle controller is waiting until router booting is over and then starts to accept commands. In addition it is possible to connect up to 9 Dallas DS18B20 temperature sensors for monitoring (board, room, etc). USB extention cable is cutted. 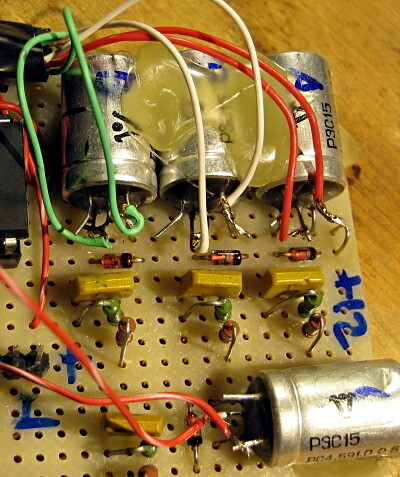 +5V, Data+, Data- wires are going via relays. pppd_cmd="$pppd call provider" # or how you initiate PPP link? $logger "PPP iface doesn't exist"
$logger "Pppd rv is $rv"
$logger "Running pppd after ping failover"
$logger "Pppd return status is $rv"
Ok. Now we done. Thank you for a patience. Probably I have missed issues in my story, feel free to send an email if something is unclear!